Winnipeg residents are voting today on whether the city's most famous intersection will be opened to pedestrians. The story of Portage and Main began when Henry McKenney purchased a low and swampy parcel of land to build a store in 1862. It morphed into the corner of commerce for decades but, unlike most other famous corners around the world, it lacks a market square or place for people to gather. In 1976, the city opened an underground concourse and infamous barriers blocking foot traffic were erected a few years later. Portage and Main has inspired multiple musicians but most famously it was featured in the chorus of the 1992 Randy Bachman and Neil Young song "Prairie Town." 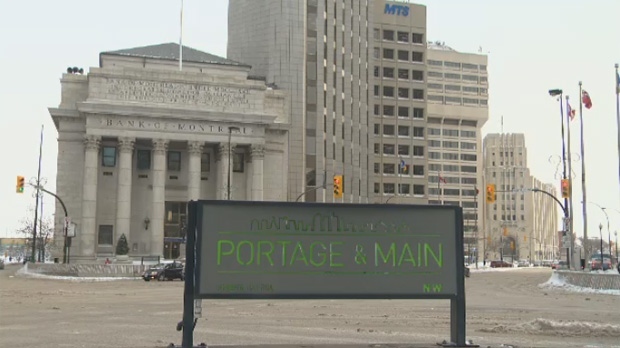 The chorus which says "Portage and Main, 50 below" references the two roads meeting in Winnipeg. It's not the only time musicians have looked to the intersection for inspiration. Stompin' Tom Connors's song "Red River Jane" takes place at the corner and Burton Cummings had a CBC-TV special named after the intersection. It has a reputation as the coldest and windiest corner in Canada, but that claim is not proven, although "Prairie Town" probably has something to do with it. The average temperature in Winnipeg for January is -16.4 C, but it dropped to -30 C or colder six times last January. To mark Canada 150 last year, about 3,600 people gathered at Portage and Main to create a living flag which will be featured on a stamp. The majority of people wore red and crowded together to create a giant maple leaf. A handful of people dressed in white were used to spell out "150" below the leaf. The downtown Winnipeg business improvement zone said the human display was the largest living Canadian flag and largest living maple leaf. There is also a 1974 eight-cent stamp featuring the corner. The corner not only has strong connections to music -- it's also linked to some big moments in hockey. On June 27, 1972, Bobby Hull stood at Portage and Main and signed the largest contract in hockey history at that time. The player, known as the Golden Jet, joined the Winnipeg Jets for almost $2.8 million over 10 years, but he was paid $1 million up front. It made him the first player to sign a million-dollar contract. The corner has always held a special place for Winnipeg Jets players and their fans but the latest round of so-called "whiteout" street parties captured the attention of the world. When the Jets clinched a spot in the second round of the NHL's Stanley Cup playoffs for the first time in franchise history last spring, thousands of Winnipeggers shared their excitement by descending on the intersection. The excited cheers of fans dressed in blue and white, some wearing wigs and others holding up giant Jets flags, filled the corner and echoed through neighbouring blocks. Each time the Jets played a game, people continued to gather until the Vegas Golden Knights knocked the team out of the Western Conference final.